Easter is almost here and we are putting our feet up for a short break. You can still order from us but no order will be sent out until Monday 29th April. 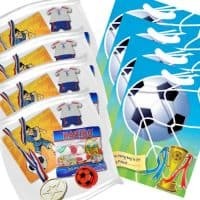 PartyBits2008 has been delivering Filled Party Bags and Party Bag Fillers for over 10 years. We have a great range of party fillers and party bags to help you with your party planning. Pre Filled Party Bags from as little as 59p. Most of our items are sold individually so you can buy just what you need.